8 October 2015: From the Amazon Rainforest to a Canberra bushland conservation area, graduating University of Canberra PhD candidate Bruno De Oliveira Ferronato is already seeing his research put into effect to save native turtles. The Brazilian scientist, who has been studying in Canberra for four years, is receiving his Doctorate of Philosophy for his work on Australian native turtles. Conservation fences installed around the Mulligan's Flat woodland reserve are protecting endangered native bettongs, but have had a disastrous impact on reptile numbers. "The fences are blocking the turtle's natural paths between ponds, dams and other waterways in the area. Once they encounter the fence, the turtles follow it along often in the heat and sun, dying of exhaustion or predation (outside the fence)," he said. Dr Ferronato, who studied at the University's Institute for Applied Ecology (IAE), said he had relished the opportunity to do research in Australia and better understand the behavior differences of turtles in both pristine and disturbed environments. "I really enjoyed my field work in northern Canberra. It provided me with great opportunities to meet locals and explain what I was doing, studying turtles in the suburban ponds." He was also impressed by the culture of expertise within IAE, having met very supportive and friendly staff and students. "IAE has great facilities and access to all the equipment I needed for my study. I was able to share space and ideas with my colleagues and learnt a great deal from my advisors Professors Arthur Georges and John Roe," he said. Dr Ferronato put forward several options to mitigate the unintended consequences of conservation fences, including turtle-only underwater gateways into and out of the reserve and intervention by people patrolling the area to assist turtles across the fence line. As a result of his research a volunteer team is being recruited to monitor turtles at the Mulligan's Flat Conservation Area fence and to protect them from unnecessary harm. 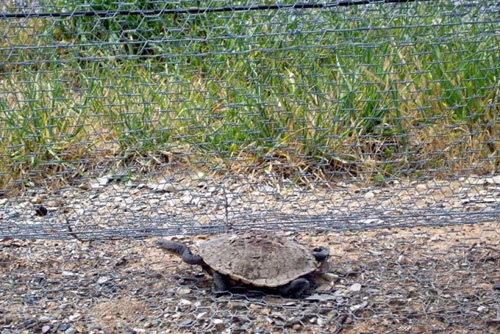 "It was great to see some results from my PhD being used by local agencies to mitigate the impact of a fence on the local long-necked turtle population," Dr Ferronato said.